Isn't that skirt a little short for a Stormtrooper? Just when you thought the world of Star Wars only went as far as Lucas’ beloved galaxy, the fashion industry tosses its hand-sewn gauntlet to the ground and presents a small collection of looks inspired by the upcoming film, The Force Awakens. 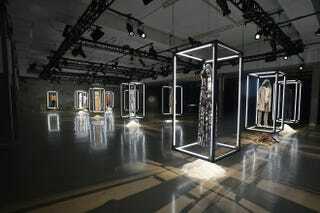 Over a dozen designers designed looks, for modern ready to wear, that reflected a character from the new film. Some are obvious, like Cynthia Rowley’s BB-8 street casual look, and others, like Bill Reid’s Chewbacca, distill the concept into a subtle nod to a beloved character. Opening Ceremony’s Stormtrooper might have gone a wee bit over the top, but more approachable looks, like Halston’s Kylo Ren and Diane von Furstenberg’s Rey ground the collection in elegant simplicity. The entire collection will be visible in Bloomingdale’s New York, 57th Street windows, starting tonight, and all the looks will be auctioned off to benefit a children’s charity. May the fashionable force be with you!